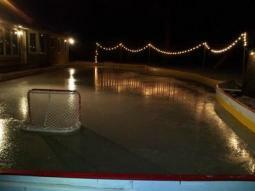 Central Ohio Rink on a Sloped Backyard. 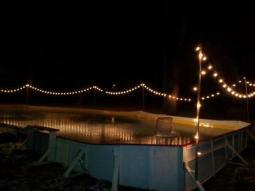 My 2 year old originally started me on the idea of a backyard rink after watching a live hockey game and saying that he wanted to play hockey, too. So, on a particularly cold day, with just some left over construction materials - 2 x 12's, rebar stakes, a big sheet of plastic and a hose, we soon had a 30' x 20' rink! It wasn't long after that when neighbors and all the little kids all started coming over to try it out and it's been the best thing we've ever done to make new friends in the neighborhood! Now it's about 76 feet long and 35 feet wide, snakes around a huge tree, is uniquely shaped to match the contour of the slope of our yard (sort of the shape of a big SUV from the side), slopes at least 22" from one end to the other and is only about 3' from the back of the house (and all the windows!). I think the next investment will be protective netting for the windows and for pucks on the ends. Right now, most of the kids can't lift the puck, but I'm sure that day will be here soon enough!